Twenty-five years since the violent end of Communist rule in 1989, Romania’s Presidential elections held on November 16th proved a dramatic watershed moment. The socialist old-guard candidate and current Prime Minister, Victor Ponta, was trounced by reform-minded Klaus Johannis, himself mayor of the small but resurgent city of Sibiu in Transylvania. Most surprising was that a Ponta victory was anticipated in most pundit predictions. Of all post-Communist-era East European countries, Romania’s twenty million people may have suffered the most. The effects of a harsh ego-driven dictatorship and a ruthless secret police left deep scars. These endured through the continued hold on power by old-guard communists turned new-guard socialists. Many of the latter morphed into corruption-fueled new-money capitalists thus helping subvert the potential growth of the national economy. What changed? A new post-Communist generation – 20 to 40 year-olds – reached maturity and found its political voice. This became surprisingly evident when at the end of 2013 almost three months of nightly demonstrations were sustained in Bucharest the capital city, some as large as 20,000 in number, in opposition to the licensing of gold mining rights to a US-controlled but Canadian-registered company tainted by the origins of its licensing claims and environmental impacts. Spreading into Romania’s largest cities, the demonstrations were driven by social networking and a new awareness of the potential power it could mobilize. Parliamentary chicanery soon added fuel to the fire. Click here for story of the protest by Dan D.
This Presidential election marks a symbolic end to this nation’s tainted Communist-era legacy. Young people, with little direct memory of Communist times and a growing impatience in the debilitating effects of corrupt and inept governmental actions, caused a dramatic political turn-of-events by exercising its right to register a vote of no-confidence in the entrenched old-guard. Note: The views expressed above are personal and do not reflect any official government views. The first time in my life Romania is free. – It is amazing and excellent news that such an engrained party as the PSD is out of the presidency. The alternative would have sent Romania back in a big way. The corruption will still be there and we will have to see how effective Johannis really is trying to root it out. It is amazing and so evidently telling that parliamentarians are seeking immunity. – Indeed a fantastic moment for our country. Given what’s going on in the world I think this is as big as the Revolution that started in my home town – TImisoara. – Right on the Mark !!! I was my daughter’s age when I dreamed this dream for the first time…. – As luck would have it I was in Sibiu the Thursday November 11 before the election and witnessed a very energetic but peaceful demonstration of well over 500 demonstrators in the main old-town square in front of the mayor’s office and the Brukenthal Museum. The demonstration started out after dusk with just a dozen or so protesters gathered in the surprisingly warm evening air, waving brightly colored blue, yellow and red Romanian flags and chanting slogans. 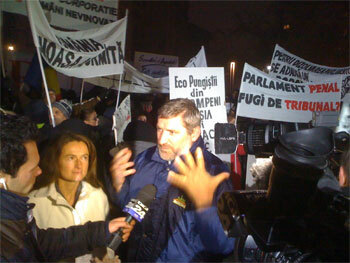 They were protesting against the Romanian government of Ponta’s socialist party’s role in the 1st round elections. As the evening progressed more and more people flowed into the square, some from the streets at the ends of the square, and others through the arched entryways from adjoining streets and squares. Once they reached critical mass, they paraded around the square filling the night air with their loud chanting, whistles and drums. Their energy was palpable and it gave one hope that, just maybe, change was really in the air and a reform-minded candidate might win. – It feels good to be in Romania these days. It feels as if we’ve all recovered from a hangover and we can finally move on with things. People are very optimistic, they know they won’t see immediate change, but they want to believe that an ethnic German will be able to bring rigorousness and order to 25 years of chaos. I still can’t believe he’s been elected and I am thankful to the entire Facebook/Diaspora revolution that made the difference. 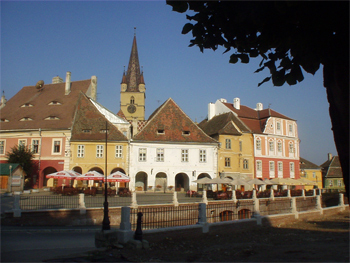 NOTE: The transformation of Sibiu/Hermannstadt was in great part an achievement coordinated by Mayor Klaus Iohannis. My first visit there was in 1968 and then many times again starting in 2001. 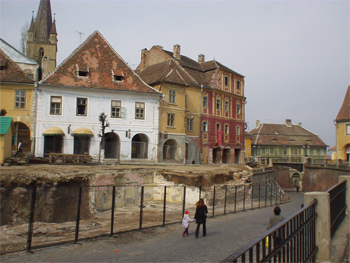 The changes, exemplified in before/after photos of Piata Mica (2001 & 2005) are dramatic. Click here for more photos.